Vikingmania is a light-hearted look back at the time of the Vikings, through the medium of the slot machine. It features three rows, five reels and twenty win lines. It also has a suitably juicy top prize and some awesome bonus features to boot. 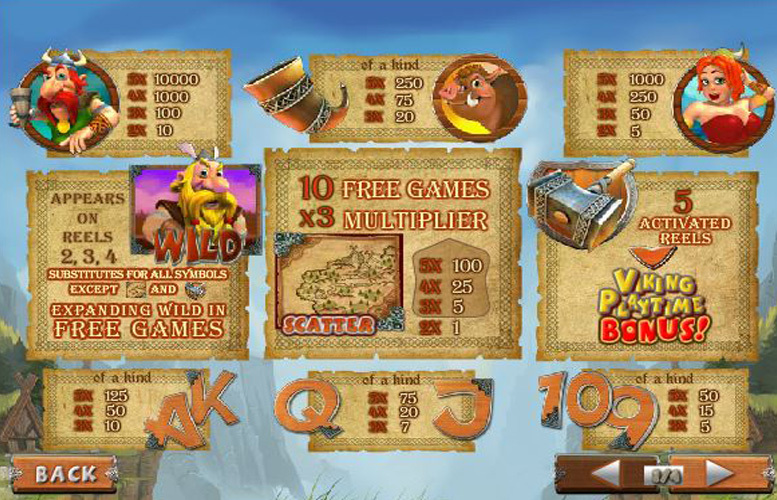 Take the ten free games with 3x multiplier for example – it can really help players accumulate the juiciest pay outs. This coupled with the fantastic, interactive “Viking Playtime” bonus sets this title up to be one we’ll revisit again without getting bored. The art style is suitably cartoony for the tone of the game – it’s certainly not the blood thirsty Vikings of some literary descriptions. For a fun, easy-going slot machine experience this one comes well recommended. Interesting and interactive bonus features. Not only does Vikingmania feature a free spin round with a tasty multiplier, it also has an amusing side game involving throwing axes and the like. High main game jackpot. We love machines that offer five-figure top jackpots. Let’s face it, who doesn’t? Very low upper betting limit. The maximum possible bet is just £100, making Vikingmania one to avoid if you’re looking to seriously splash some cash. Viking man = 10,000x the line bet. Viking woman = 1,000x the line bet. Horn, or hog = 250x the line bet. Vikingmania features two great side games which really add replay value to the title. 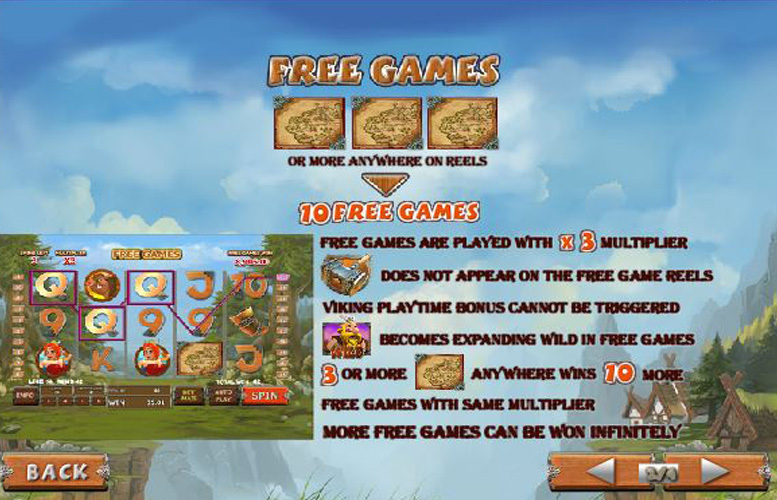 Landing three or more Viking maps anywhere on the reels will trigger ten free games. During bonus spins, all winnings will also be multiplied by three. What’s more, when playing in this mode, all “wild” symbols become expanding “wilds” and landing an additional three maps anywhere will trigger an additional set of free games. This is a dynamic that can occur infinitely too. Players should note that during the free games, the hammer of Thor symbol does not appear on the reels, and the Viking Playtime bonus cannot be triggered in the mode either. Landing the hammer of Thor symbol in the central position of a reel will activate the bonus for that reel. 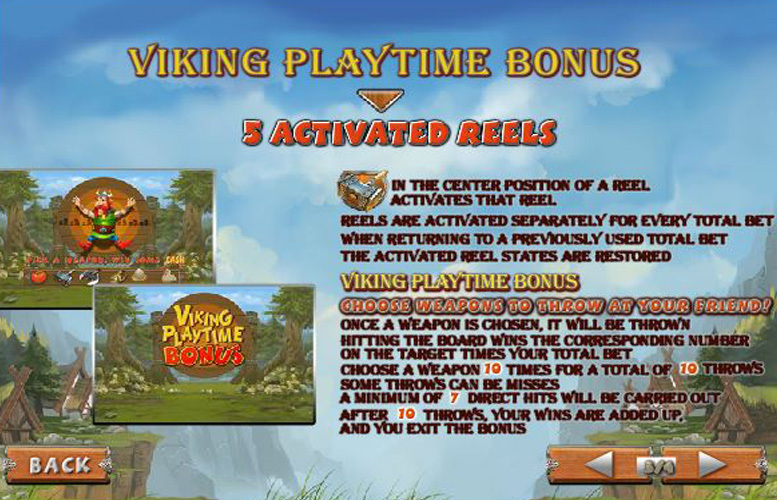 Once a player activates all five reels, they will trigger the Viking Playtime Bonus. First, they must choose a weapon to throw at their friend. Once chosen, the weapon is thrown and will hit the board. Wherever it hits corresponds to the number on the target multiplied by the total bet amount. Players can choose a weapon ten times for a total of ten different attempts at winning prizes. The game rules state that a minimum of seven direct hits will be carried out. After ten throws have been completed, all winnings are added up, and players return to the main game. Ace, or King = 125x the line bet. 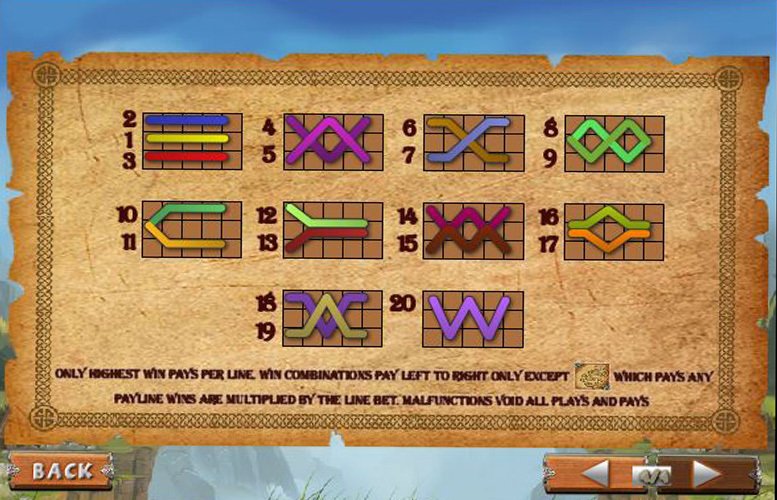 Players can adjust both the number of win lines played per spin on Vikingmania, as well as the amount of cash waged per line. The minimum line bet is 20p, while the maximum is just £5. Therefore, the minimum possible bet per spin is just 20p, and the highest is a somewhat underwhelming £100. Clearly, Vikingmania was not built with the highest rollers in mind. 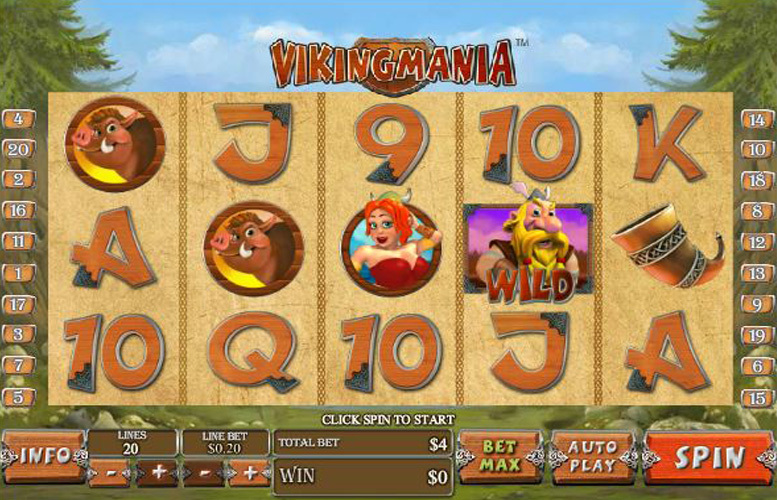 Players who enjoy slot machines that don’t take themselves too seriously can do much worse than checking out Vikingmania. With its cartoony artwork, fully interactive bonus features, and huge top jackpot, it’s not only highly enjoyable but also potentially lucrative too. Unfortunately, the machine is let down by its low upper betting limit. Whilst £100 a spin will certainly appease many players, the figure pales in significance when compared to those which allow bets of up to 50 times the amount per turn. This game has a rating of 4 / 5 with 329 total reviews by the users.